Back in 1975, when the Viet Cong (Vietnam communist party) took control of Vietnam, many Vietnamese most if not all suffered the consequences. Many say that Vietnam was worst than what it was before, people went hungry, no support from outsider, not even their own communist regime ally like the Russia and Chinese. Not a surprise, later even their own military personnel in Vietnam, so call Viet Cong, even admitted that their government treated the people worst than when the American were around in Vietnam. Years passed, knowing that their communist regime ally Chinese and Russian don’t help Vietnam much, the government decided to look else where and began to open door for trade. It was a desperate attempt, but a good workable solution. The country became a little more open for outsider, foreigner to visit and invest, and eventually export and import more open than before which in the end Vietnam today became one of the world fastest development country in the world. Although some old habits still exist such as bribery, the rich getting richer, and the poor getting poorer. Luckily, many Vietnamese in Vietnam whom have relatives live abroad, such as in America and Europe, will sends money home to support their family still back in Vietnam. April 30th 1975 was the saddest day of Vietnam. People in Saigon, South Vietnam tried everything that they could to flees the countries with the American, but unfortunately there wasn’t enough seats for the voyage to Amerca. The American allowed theses folks to come with them to America, but just that limited tickets, seating for the long voyage. All ships were full, all military aircraft and even passengers plane were full. The last passenger plane flew out of Vietnam were overweight but luckily it made it out. 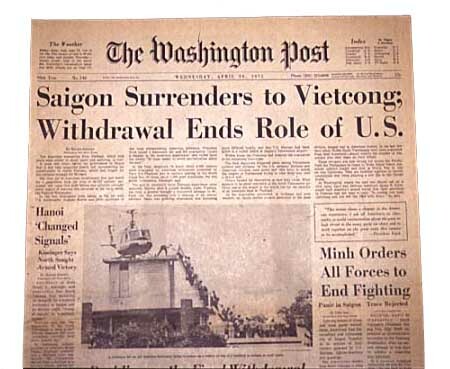 The Fall of Saigon April 30th 1975 Vietnam fall into the control of Communist regime. For the people that got left behind, the communist took over the so call White House, or the south Vietnam government place, and that was it, some say not even a single shot fired. The communist basically walk in and was welcome, and took over the country. There were many horrific stories about the war which I cannot go into detail, but the tragedy of war exist on any war. War is bad, but it’s the solution to a temporary problem. Negociation failed, can we blame both side leadership skills? This entry was posted in People, Politics, Travel by admin. Bookmark the permalink.